Welcome to Gran Canaria holiday home, a four-bedroom modern ground floor apartment (with no steps into the house- disabled friendly ) located 5 minutes walk from the beach of Puerto Rico and 2 minutes walk from the Harbour. the town with all pubs,bars, eaterys is only 6-10 minute walk . This apartment has a perfect location for everyone right in the heart of everything you could need. The apartment over looks the harbour deportivo and is only 5 minutes walk from the local beach of Puerto rico and 20 minutes slow walk from the STUNNING world famous Amadores beach. The apartment is fully equipt for all ttypes of guests, to a family sleeping 8 or couples, cyclists, or friends and relatives. The apartment has everything you could need mod cons including IPTV TV, iPod docking station, DVD, iron and ironing board, hob and oven, kettle, toaster, microwave, hairdryer, and most importantly Wifi available. The apartment can cater from 1 person up to maximum of 8. This modern fully equipped for bedroom ground floor apartment brings together style and all the home comforts with all commodities that you may require whilst on your holiday in sunny Puerto Rico. We really feel we have ticked every box to make you feel as if your in a home from home. The four bedroom apartment Is fully air-conditioned throughout, it is stylishly decorated and furnished for your every need. When you enter the building you enter through the double glazed security green front door which is on the street next to the local hotels which has ample parking for your hire car to park on the street outside without any payment. The living room is spacious and with plenty of light via the double glazed windows with security locks, there is a large six place designer sofa , a large unit with drawers and cupboards and a 42 inch plasma TV which you can plug your fire- stick into or laptop or mobile devices. We also have a internet tv box which you can use. There are Fees for breakages or losses so be aware we do check these before you enter the property and we do a full itenary. We provide also an internet box which enables you to watch TV via the Internet from any country Live including all your sports, movies and children’s channels using Internet apps. (this is a small island so internet can be intermittent, normally stable but we do get some downtime especially in busy periods so we do offer the service of internet , but cant gaurentee it as its beyond our control when it goes down. This is still ample to use for your telephones mobiles tablets and of course Internet TV in our property. This is done on a satellite system so large downloads are not recommended as it may slow other devices but perfect for streaming, emails,apps, twitter facebook, whats app etc. In the event of our internet going down for a period we can offer to pay for the internet from the adjacent hotel which will work for devices. The living room goes onto the dining area and has a table & chairs to accommodate six people at one time, there are 6 placemats and flowers on the table and a lamp. There is a glass crystal fruit bowl on the table. There is a separate stand lamp too for reading and a small table for your papers and remote controls and lamp for reading with ambient dimmable lighting before you know reach the kitchen area. The kitchen area is compact but we would like to think that we have given everything thought and that you have everything you may require for cooking and cleaning whilst on your holiday. Even a corkscrew and potatoe peeler, a blender, kettle, toaster microwave. Yes we have an ironing board and iron,and of course an oven and the electric halogen four hob. There is a washing machine and condensor dryer & airer for drying clothes and laundry. In the kitchen near the fridge freezer there is a key hanging on the wall which has the key to the pool and exterior security gates, we have put this on pistol to remind you not to lose this as it will cost you €100 to replace each key as they are special security keys. The pistol is big enough for you not to lose it please keep all keys on this pistol when you leave the property this will ensure you dont lose it. There is a large fridge freezer for food and drinks and also the ice for your cocktails , shakes or smoothies, we have even left you a blender to crush the ice or make your own smoothies or shakes in the house for yourself. There is also a Bluetooth disco station in each room which you can connect to by Bluetooth and play music from your phone directly to the system. We have a maintenance man who is Canarian called Salvador and he can be contacted if there are any issues in the apartment, he can fix anything and is normally available same day. message us if you have an issue. In this lovely spacious apartment we have four bedrooms. All are fully furnished and designed in a practical but modern and high-quality style and are very comfortable and thought about carefully. The first bedroom is a large double bedroom, with a large double bed in mahogany oak, a large wardrobe, a large chest of drawers and a leather couch with a lovely lamp and two bedside cabinets with lamps on, to block out the light we have wooden blinds and of course luxury bedding and the high-quality mattress to make your stay that much more enjoyable and of course comfortable. In this bedroom you also have a 32 inch plasma TV and of course an IPTV box to watch movies or live television. This bedroom is fully air conditioned with its own controller. This bedroom is second left from the kitchen and is the master bedroom, this bedroom is en-suite and has a shower and basin and washing facilities including in the room. There is also a large double bed there is two bedside cabinets with lamps ,a large wardrobe and large chest of draws with wooden blinds on the window opening and all furniture is mahogany oak. There is of course air conditioning in this bedroom too with your own remote and as standard 32 inch plasma TV with an Internet box for your movies ,games surfing the net and of course worldwide TV live using IPTV. This bathroom is a large double bathroom with a sink unit with draws underneath to store your bathroom essentials and built in mahogany wood mixer tap ,a WC and the designer glass enclosed stone shower, this is a massage shower and can massage your back head legs or body. The luxury shower is easy to use and a power shower. Out of the first bathroom and turn left you have a shelving unit with various towels and at the bottom is a safe the key is in the safe ready for you to use for free In and behind this shelving you will also find in the event of emergency the stop taps which shut off all the water to the house. Carry on down the corridor to the rear of the property and you will find on your left the 2nd large bathroom (not including the ensuite). This is a 2nd bathroom with a beautiful glass door into a walking shower and with WC ,separate basin with mahogany wood cupboards and inside here we keep the airer for your clothes and also the ironing board and the iron and can be found on the shelving in the corridor. Next left you will find a small children’s bedroom this is bedroom number three. Although Small in nature this room does exactly what you require it to do, it has a metal bunk bed with two mattresses and it has two chest of drawers tall in height to put your belongings in, closing the ladder up to the second bunk is in front of the door entrance. This room has had adults staying in there easily but it is more designed for children. We also supply at no extra cost a high chair and a travel cot and lovely push chair, if you may require it. Carry on down the corridor which is beautifully decorated with massive paintings and creative lighting in LED lighting you’ll eventually get to the final bedroom, bedroom four. We have recently change bedroom four due to recent enquiries that we have been receiving over the last two years, so now the furnishing is as follows. This lovely double bedroom, has two wooden single beds with the luxury mattresses, all modern design, a reading lamp between the 2 beds with tasteful canvases on the walls, it also has a chest of drawers and a double wardrobe to match to store your clothes in, again this is fully air-conditioned. This room is right at the rear of the property and has no exterior windows but the lighting suits and accommodates very well. It’s a spacious room and suits 2 people. There is a travel cot stored in the wardobe. We are very confident that you will love the apartment. For the budget of only £150 pound per night this accommodation has everything that you may require, it is in the most perfect location and in the wealthy, safe and lovely area of Puerto Rico it is the other side of the mountain (5 minutes walk or 3 euro in taxi from centre) so you do not hear all the music and noise from the nightclubs & bars. There is so much to do for all ages of people and activities, there is a new Angry Birds centre for familys 5 minutes away. we believe you wont get a better location to stay its perfect. We state that every guest we have had has been over the moon and majority rebook again if returning to the island, its only 3 hr 50 minute flight and only 35 minutes from the airport by car so you can be on the beach within an hour of landing. We now offer international IPTV too from most countries so you can when relaxing watch your own television channels from your own country. (internet Dependant) all inclusive. I am a professional full time property developer and I buy holiday home properties around the world to rent out to tourists and regular clients. We are set up to offer the clients the best value for money and beautiful properties in different locations. We strive to make the places comfortable, spacious and a home from home. We are a well managed property business and our team will look after you from booking to your stay. We are a professional run business with a personal friendly service. We have the very best properties on offer and great value for money with piece of mind and home comforts. value for money and quality accomodation in the very best location, need i say more? The location is the very best you can get, no steps and a beautiful location in the heart of the wealthy area of Agua de la Perra Parc. Its only 5 mins from the Puerto Rico beach. This is the best value for money at only £150 per night all year around, its a quiet wealthy area where the best eaterys are around and its quiet location and clean and modern appearance suits all ages and people. its a ground floor so no steps! You will not find a better accomodation for the money and im sure you will love it. The bathroom has wc, large hydrating power massage jets shower, basin and large wooden laundry basket and white cupboards for storage. The bathroom is elegantly tiled and is modern with luxury shower doors . The water is heated by solar power from panels. Sheets and duvets all new provided. Plenty of room to park on the street outside the apartment. Internet is included in the rental no extra cost. Towels provided only for use in the house. Beach towells are not supplied. Lovely dining room table which seats six people. This apartment is accessed through 1 front door which leads out onto the street perfect for wheelchair users. This is typically a Spanish town house bungalow and easy access without all the stairs in normal blocks. The pavement goes right round for easy route to the shopping areas and beaches. It is on the first road of the mountain and it has good pavements to walk on which is a flat surface for disabled guests. Above the Complex and apartment 30 second walk secluded and peaceful use for residents only. lovely sunshine all day from 8am until 6pm on the pool. umbrella and beds are free to use. Notes on accommodation: A home and comfortable to treat as your own and quiet and relaxing. If you are looking for a nice area away from the hustle and bustle of the shopping centre but just a stone throw away from all the action then this is the one for you. It's strategically priced for good value for money and is clean tidy & modern. Recommended maximum people would be 8. Extras are available on request such as welcome packs and airport transfers. Please let us know if you have any further requests or questions and we will be happy to help Outside: The apartment has use of various communal areas, there are gardens which are shared with 8 other apartments and also a BBQ area to the side of the shared private pool. There are patio areas also which can be used above the apartment. Lovely views over the harbour which is relaxing. The apartment itself does not have it's own terrace, most guests don't mind they just use the patio instead. The pool is heated by the sun which makes the temperature ideal most of the year round. We always use it when we go over even in December and in the winter months. Utility Room: There is if hired as a 3 bedroom apartment a utility storage room, this is used for dryer and storage. It has been used previously for golf clubs, expensive cycling equipment or bikes and of course surfing equipment or just general storage . Cleaning / Towels / Linen / Maid service: The apartment will be left clean for your arrival and you will met by our management who will show you everything. Dependant on the length of your stay will determine which cleaning and laundry requirements you have. On average we change laundry weekly. Other: The apartment has a shared use of a private pool for 8 apartments . A key will be provided of which a deposit is required on arrival. The pool is secluded and private and clean and presentable it also has separate children's pool. Beautiful and very clean apartment, very big with lots of space for 7-8 people to stay in !!!! Apartment next year- thank you very much . Great place to stay close to all the amenities. Paul is a great host alwAys on hand to help with any queries night and day. Will be using the apartment on our next visit. Lovely people and pleasure to host you. You left the place beautifully clean and 100% perfect guests. Absolutely love this place! Without a doubt I would recommend it. The apartments got plenty of space, and it’s very clean and tidy! The location is perfect as got a supermarket and some very nice restaurants just down the road. Also the beach is within a 5 minute walk. Definitely coming back again next year! We loved our stay in Puerto Rico! The apartment is well equipped and very clean. The location is great: only a short walk from all the main attractions. There is also a smaller commercial centre locally with a large supermarket and range of very nice restaurants. Also the host Paul, was friendly and helpful. He was in touch with us during our stay, giving us helpful information about restaurants, places to visit and how to use the facilities within the house. Our kids especially enjoyed the pool directly above the accommodation, using it most days. The satellite TV was also a godsend as my father was happy to stay indoors during the hottest days and watch some sports. Every channel you could possibly want was available and very simple to use via the internet TV. All in all the apartment and location were great and I would recommend staying here. Thank you so much Mr Harris for your lovely review. We were very happy to accommodate your family. You were the perfect guests clean,tidy ,well mannered and left the place at the end of your stay spotless. We extremely pleased that you loved the place we have tried very hard to think of everything to make it a home away from home (including the Internet TV boxes? We glad you loved the pool upstairs some clients don't use the pool which is a shame as it has lively views and is normally really quiet and so close if you need to nip off for a siesta. We trust the weather was great and you had an amazing time. We are looking forward to having you stay again in the future and thank you so much. It was my pleasure speaking to you on the phone during yout stay and going through your queries. The internet tv can be hard to grasp at the beginning. If there was such thing as a perfect booking this was it. All the best and thank you again. Best wishes to you and your family. Very big and comfortable apartment. 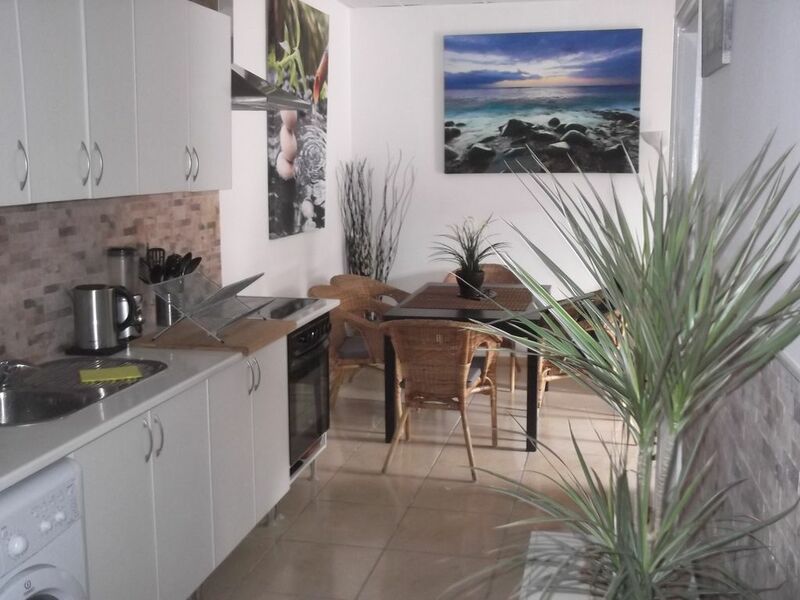 Welcome to Gran Canaria holiday home, our recently refurbished four-bedroom modern ground floor apartment placed in the urbanisation of Aqua De la Perra Parc near Puerto Rico Harbour less than 1 km away from Puerto Rico main town centre. A beautiful 4 bedroom ground floor apartment, perfect for use for anyone and also for disabled guests as there are no steps to climb. Situated in the quieter side of the mountain of Puerto Rico in Agua de la Perra. It's only 5 minutes walk from the local shopping centre where you will find good eatery and bars and shopping or your just 1 km away from the main shopping centre of Puerto Rico. The apartment is newly refurbished (less than 1 year) with all the mod cons including Satellite TV, iPod docking station, DVD, iron and ironing board, hob and oven, kettle, toaster, microwave, electric fans, hairdryer, and most importantly free Wifi. The apartment can cater from 1 bedroom rent to a maximum of 5/6 or 8 with children using the bunk beds room. This modern fully equipped for bedroom ground floor apartment brings together style and all the home comforts with all commodities that you may require whilst on your holiday in sunny Puerto Rico. We really feel we have ticked every box to make you feel at a home from home. The living room is spacious and with plenty of light via the double glazed windows with security locks, there is a large six place designer sofa , a large unit with drawers and cupboards and a 42 inch plasma TV which you can plug your fire- stick into or laptop or mobile devices. We also have a internet tv box which you can use. Fee for breakages or losses so be aware we check these before you enter the property and do a full itenary. We provide also an internet box which enables you to watch TV via the Internet from any country Live including all your sports, movies and children’s channels using Internet apps. We have free Wi-Fi included in the rental which is quite quick in comparison to many Spanish resorts not quite as quick as the UK but still ample to use for your telephones mobiles tablets and of course Internet TV in our property. This is done on a satellite system so large downloads are not recommended as it may slow other devices but perfect for streaming, emails,apps, twitter facebook,whatts app etc. The living room these onto the dining area in the dining area has a table And chairs to accommodate six people at one time, there are 6 placemats and flowers on the table and a lamp. There is a glass crystal fruit bowl on the table. There is a separate stand lamp too for reading and a small table for your papers and remote controls and lamp for reading with ambient dimmable lighting before you know reach the kitchen area. The kitchen area is compact but we would like to think that we have given everything thought and that you have everything you may require for cooking and cleaning whilst on your holiday. Even a corkscrew and potatoe peeler from the uk and a blender, kettle, toaster microwave. Yes we have an ironing board and iron,and of course an oven and the electric halogen four hob. There is a washing machine and airer for drying clothes and laundry. In the kitchen near the fridge freezer there is a key hanging on the wall which has the key to the pool and exterior security gates, we have put this on pistol to remind you not to lose this as it will cost you €100 to replace each key as they are special security keys. The pistol is big enough for you not to lose it please keep all keys on this pistol when you leave the property. There is a large fridge freezer to accommodate your food and drinks and also the ice for your coctails , shakes or smoothies, thinking about it we have even left you a blender to crush the ice or make your own smoothies or shakes in the house for yourself. There is also a Bluetooth disco station which you can connect to by Bluetooth and play music from your phone directly to the system. There is a white cupboard in the kitchen which has some tools and if you need bits lightbulbs etc that may be used if you require them. We have a maintenance man who is Canarian called Salvador and he can be contacted if there are any issues in the apartment, he can fix anything and is normally available same day, the best way to do that is to call Robert our resort manager and asking him to liase and to contact Salvador.